Get notified when Elton John tickets are available! Sir Elton Hercules John is a well-loved English singer, songwriter, composer, musician and Rock and Roll Hall of Fame inductee. In his career that has spanned over five decades, Elton John has sold over 300 million records, solidifying his place as one of the best-selling musical artists in the entire world. His success includes more than 50 Top 40 hits with seven consecutive No.1 albums in the United States. 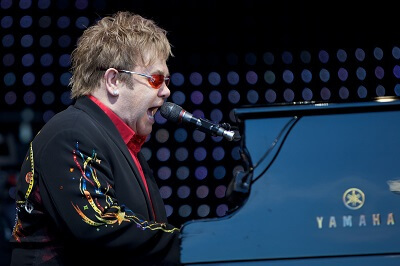 Known for tracks such as “Can You Feel the Love Tonight,” from The Lion King, “Candle in the Wind,” and “Rocket Man,” you can see these songs live when you attend a concert in a location close to you by purchasing Elton John tickets using the links above.